Home » budget » Souvenir Shopping? Think memorable moments! Don’t believe me? Check this out! 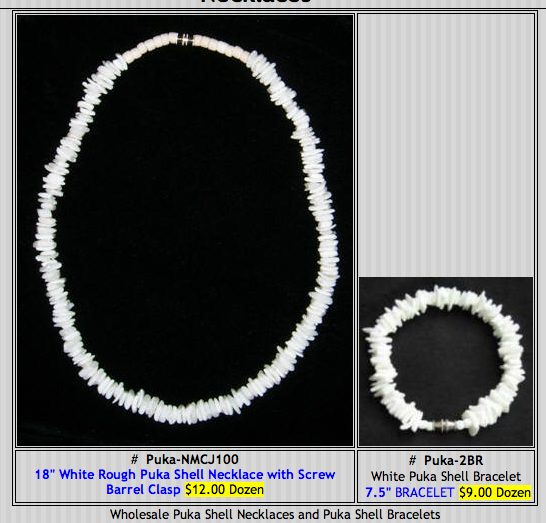 Popular sea shell necklaces at beachside shops sell for $7-15 each. The higher end the shop, the more expensive the necklace. BUT, those retailers purchase those necklaces for $1.00 each. I understand that stores need profit to survive. They make most of their money during the high season. I get it. 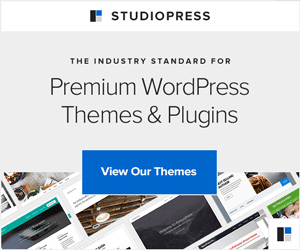 But, this blog is about budget family travel. I don’t know about you, but my daughter’s tears as her necklace falls apart on the drive home from the beach do not make for a pleasing end to vacation! We have learned (slowly, somewhat painfully at times) to treat souvenir shopping differently. Instead of impulse purchases at a souvenir shop, we now look for memorable moments to preserve and cherish. You know those penny pressing machines at amusement parks? They make great inexpensive souvenirs only $1.01 — the penny (to get pressed) and 4 quarters to press it. Kids insert their penny. Parents insert the four quarters. Crank the handle and voila! This hand-made souvenir fits in a pocket and makes a great keepsake for all of $1.01! Another option, though more expensive, is taking a class to create something uniquely yours. At Vetro Glassblowing in Grapevine, Texas, guests can watch master craftsmen blow glass into amazing creations — from Christmas ornaments to elaborate glass chandeliers. Even more fun, guests can attend a glassblowing class to create their own souvenir. 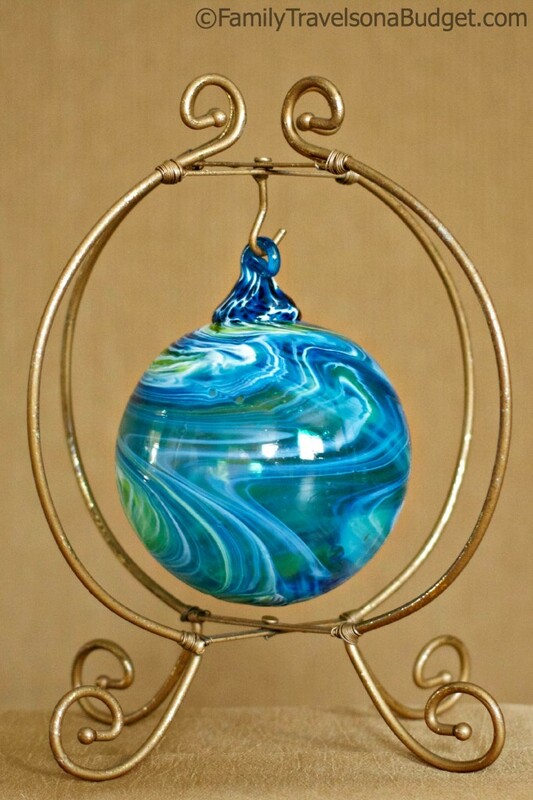 I was there in December, when Vetro Glassblowing offered classes to make Christmas ornaments. In May, they’re offering a class on glass flowers and/or bowls. My glass ornament is probably my favorite souvenir of all time. Knowing that I made it — with just a bit of help — from the color selection to the swirl pattern on the ball makes it more special. I could have purchased one of their ornaments for sale in the gift shop, but saying, “I made it myself!” means as much to me now as it did when I was a kid! I’ve written before about our fabulous foodie experiences on road trips. As a rule, we dine locally wherever we go. When we can, we buy something to bring the taste home. 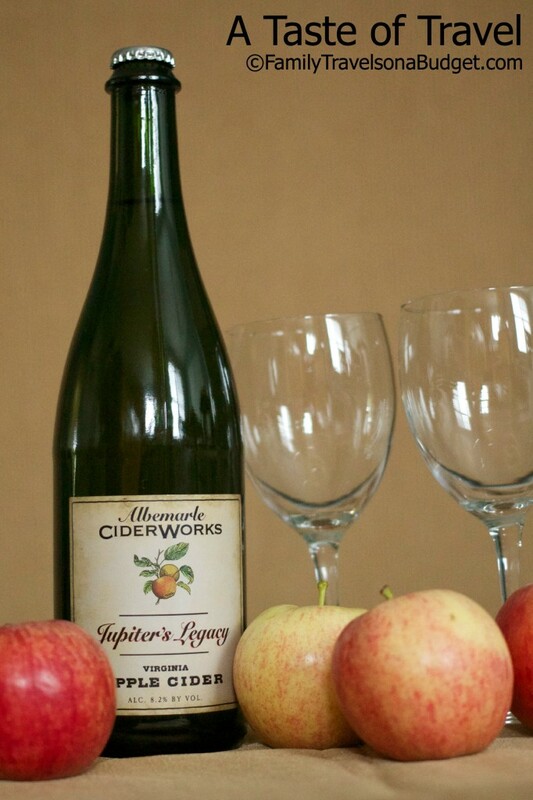 In Charlottesville I enjoyed a hard-apple cider tasting at Albemarle Ciderworks. After tasting many interesting brews, I bought a bottle of my favorite to share with my husband. In the Bahamas, I visited a local shop and brought home a bottle of their marinating sauce. Other places, I’ve bought locally roasted coffees, teas, honey and pralines. Whatever the region is known for, taking home a taste is an easy way to savor the memorable moments. Let’s face it… kids (and even us grown-ups if we admit it) love stuff. After a while, though, just like the happy meal toy, they break or end up buried in the bottom of the sock drawer. (You know it’s true!) So, instead of spending hard-earned cash on something not made to last, how about looking for freebies that commemorate memorable moments? 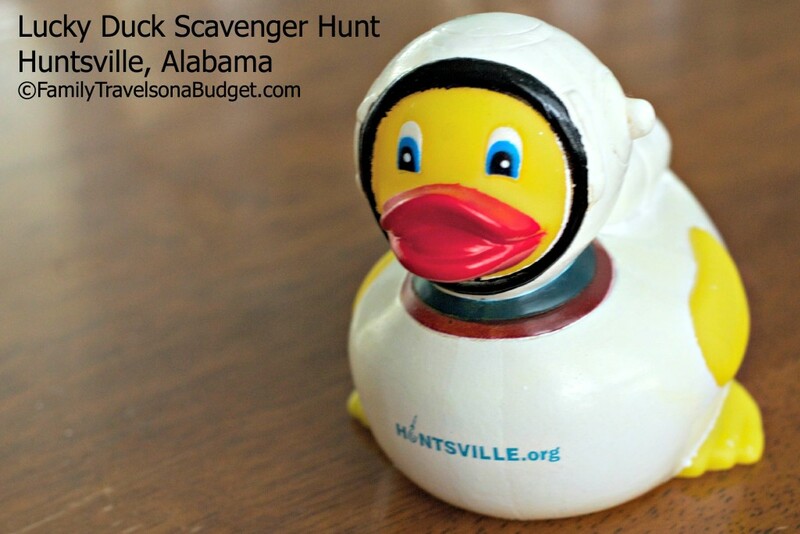 For instance, Hunstville, Alabama offers a Lucky Duck Scavenger Hunt to visitors…. I’ve been told it’s particularly popular with the college crowd… go figure! Find the brass ducks hidden throughout Huntsville using the provided clues and receive a special prize at the end. Our family did this back in February, and the kids loved it. 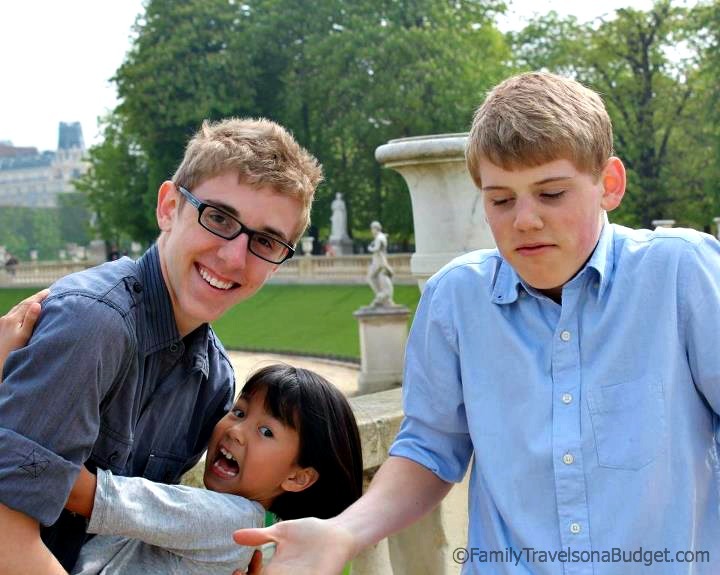 Our favorite — absolutely, hands-down, best ever — souvenir of our Paris, France trip was this photo. Planning to take a staged photo of the kids (you know — palace as a backdrop, kids lined up Sound of Music style from shortest to tallest) I got lucky and this happened instead. The photo hangs in our breakfast nook and literally brings a smile to my face every day! 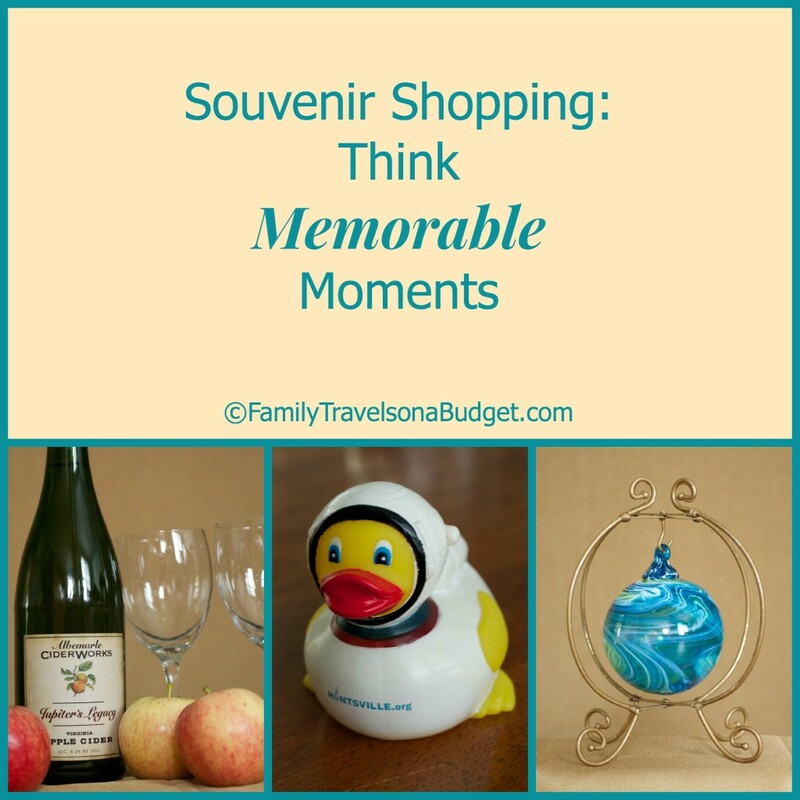 Souvenir Shopping: Think memorable moments! Whether vacationing at an exclusive resort in the South Pacific or hanging out in Nashville, souvenir shopping can be more than those cheap trinkets at the tourist trap! Can I take home a piece of this place (whether food or a handcrafted item local to the region)? Will this make me smile a year from now? Create that souvenir budget, but shop based on memorable moments and experiences to get the most out of that budget. What’s your favorite souvenir of all time? I buy collectible spoons wherever I go, but for the most part, I’m a huge advocate of “memories are the best souvenirs” so my favorite is the photo. Great question “will this make me smile?” – for all occasions! Thanks Elayna! My mom-in-law collects thimbles, another small trinket easy to display and carry. 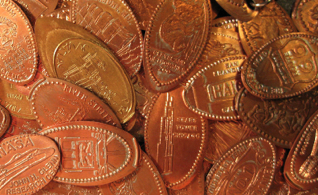 Did you know those pennies become collectibles? If you have some old ones, they might be worth $3-5! Me too. We get a Christmas ornament every year. After 24 years of travel, I’ve reached full mug saturation — and then some. Moved on to fun hot mitts. The pic of your children is priceless and I know you love looking at it all the time! As for souveniers-I could not agree with you more. They tend to be expensive and why oh why do they either get lost or break (and I have no children!). I love the picture you’ve shown here too. That is the perfect souvenier! We started doing the pressed pennies for the kids on our FL trip and bought them a penny passport. Helps keep costs down and we don’t acquire more stuff we don’t need. Jessica, you’re a mom after my own heart! Where in the world did you find a penny passport? What a fabulous idea! Those are some great tips. I loved pressing pennies when I was a kid in Disney.